Units 1-4 Knowle Hill Business Park, Hurley, United Kingdom, CV9 2JE. The Forklift Company are proud to introduce our budget brand of forklifts – Reddot. Why buy a used machine when you can buy brand new at such a great price! These machines are a simple, strong, reliable, no nonsense budget forklift truck. 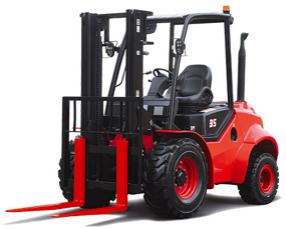 They are an ideal entry level forklift that represents fantastic value for money in both upfront cost and cost of ownership. Every Reddot machine comes with a 12 months parts & labour warranty and there is a ready supply of parts available in the UK. Reddot is a simple but powerful machine that has been designed to support your daily operation at a brilliant price point. Reddot are part of the EP family making machines for Jungheinrich, Still and Linde. The Forklift Company Limited is Regulated and Authorised by the Financial Conduct Authority. We act as a credit broker in any finance transaction to find a suitable arrangement for you. There may be circumstances in which these figures could vary depending on finance house approval. The terms contained in this quote do not constitute or imply a commitment to provide funding, nor a representation that such funding will be made available. This quotation is subject to status and for business use customers only. We will only use your contact details to deal with your enquiry. If you would like us to keep you up to date with our latest news and offers, please tick the box below: Yes, please contact me with your latest news and offers. The Forklift Company Ltd is committed to providing our customers with the best value forklifts available in the market Today. We offer New Utilev forklifts which are part of the Hyster and Yale family which come with a full 24 months/2000 hour parts and labour warranty. We hold up to 150 used machines at any one time at our depot here in the Midlands. We wont be the cheapest but we represent the best value across all of our product lines. We offer independent Thorough Examinations(MOT) from Statutory Inspections Limited, receive assured advice from Trading Standards, and give all our customers the option to take 0% finance on used equipment. We offer a minimum 3 month warranty on every used sale machine and every customer has the option to extend this to either 6 or 12 months. Every forklift we offer is available to view prior to purchase, and all our customers are invited to come and see their machine and our operation before committing to buy. And for complete peace of mind we offer a 30 day money back guarantee. ©2019 The Forklift Company. All Rights Reserved. All sale machines, whether on finance or outright purchase and any machine on a 12 month or longer hire contract will be delivered anywhere in England free of charge. Any hire forklifts on less than 12 month hire contracts will have delivery and collection charged at cost. Trucks delivered to Scotland & Wales may incur an additional charge. We are that confident in our products that all our used machines are delivered with a minimum 3 month parts and labour warranty. We also give you the option to extend the warranty to either 6 months or 12 months full parts and labour for an additional cost. If you are not completely satisfied with any used forklift purchased from The Forklift Company Ltd within 30 days of delivery then we will fully re-fund any money you have paid and collect your forklift. We only make this offer because we have such confidence in our products, and stand behind our quality. Any used forklift on our website can be purchased on 24 months 0% finance with the addition of four optional extra’s from the available options menu. This is the cheapest way to buy your next forklift. If you need a truck, but without the optional extras, we offer competitive 3 or 5 year standard finance options to suit every budget. We offer every customer a site survey, if you need one of our technical sales team to come to your site and verify what your exact requirements are we can do this for you. All site visits are charged at cost, and these charges are refunded if you decide to purchase a truck from us. If you are confident of your requirements, or are replacing an existing machine we will clarify all your requirements via an e-mailed questionnaire which every customer must complete and return prior to an order being placed.